Welcome to Qismat Yinus' Blog: Fayrouz Joins Darey,Kelly Rowland To Deliver The Concert Of The Year,LLAM 2!!! Fayrouz Joins Darey,Kelly Rowland To Deliver The Concert Of The Year,LLAM 2!!! Nigeria’s natural premium soft drink Fayrouz joined superstar entertainer Darey and US singer, Kelly Rowland to deliver the concert of the year for the second year running. 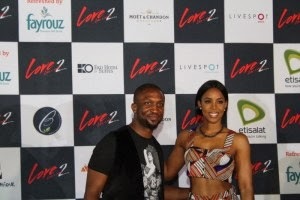 Love Like A Movie 2, which held on Saturday, February 15, 2014 at the Eko Hotel & Suites Oceanview Grounds witnessed some of the greatest musical performances ever held in Nigeria and Fayrouz shared the great experience with loyal consumers and music lovers who were specially invited by Fayrouz. Starting out the event with a cocktail session in the Fayrouz VIP lounge, guests enjoyed a variety of Fayrouz exotic cocktails as they mingled with celebrities and top bosses in the marketing, banking and entertainment industries. “We are excited to be a part of an original concept such as Love Like A Movie 2; a collage of music, dance and extreme theatrics that touched the soul, with Fayrouz in all it’s variants including original cocktails refreshing guests. It was pleasing to see people keep coming back to have more of our Fayrouz cocktails. This year’s edition of LLAM2 was a huge success and we are happy our fans were opportuned to have this unforgettable experience.” Senior Brand Manager, Fayrouz, Nnenna Ifebigh-Hemeson said after the show. Notable faces at the Fayrouz sponsored event included Managing Director, Nigeria Breweries, Nicholas Verveldi, Corporate Media & Brand PR Manager, Nigerian Breweries, Edem Vindah, Corporate Affairs Adviser, Nigerian Breweries, Kufre Ekanem, Marketing Manager, Non Alcoholic Drinks, Nigerian Breweries, Sampson Oloche, Brand Manager, Fayrouz, Nnenna Ifebigh-Hemeson, international singer, Brandy, Mai Atafo, Dede Mabiaku, DJ Jimmy Jatt, DJ Spinall, Sound Sultan, Gbemi Olateru-Olagbegi, Sasha among many others. LLAM2 featured epic performances from Darey Art Alade and international singer, Kelly Rowland as well Waje, Tiwa Savage, Timi Dakolo, Mo Eazy, Zaina, Eva, Muna among many other acts. Fayrouz has been a part of Love Like A Movie since last year’s maiden edition, which featured international reality star, Kim Kardashian. Wow..... It was a very sweet one. Finally ä♍ able to comment! Thank God!